The two bright, easy to read LED displays facilitate very easy setting of the required temperature for each block and also allow accurate monitoring of the actual temperature. 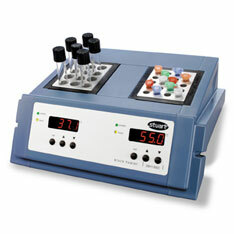 Choice of model offering 130°C or 200°C maximum temperature. Uniformity within block at max temp.